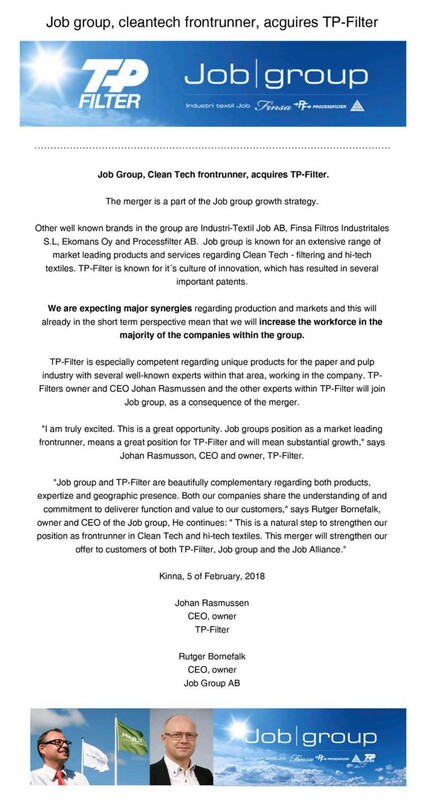 Job Group acquired TP-Filter 2018. The merger is a part of the Job group growth strategy. Read more about the merger here. Innovative and environmentally aware companies all over the world come to us for the most critical part of a filter – the element that makes the filtration take place. Cutting-edge technical expertise and a unique capacity both to develop products and to mass-produce them for our customers have given TP-Filter an exceptional international position. We deliver them both to producers, including a broad spectrum of machine manufacturers, and to end users in the paper, pulp and water treatment industries, for example.